The Health Policy and Management department’s required field experience course provides senior level students with an on-site experience working within local hospitals, nursing homes, government regulatory agencies, or non-profit organizations dedicated to public health or health advocacy. Placements in the field are arranged with and supervised by a member of the HPM faculty. On site supervision is provided by a preceptor within the host organization. During the course of their field placement, students will have many opportunities to learn from practitioners and to practice their professional skills in real world settings. In the field, students will be expected to apply concepts and skills from their previous coursework to practical problems in their organization. The field experience also offers students a unique opportunity to “test drive” a career. A successful internship will provide students with letters of reference, networking opportunities, and first hand experience in the “real world” prior to graduation. Students obtain a field placement through a process of mutual selection. Working with the HPM department’s Field Experience Coordinator, students prepare a resume and a cover letter that summarizes their qualifications, skills, and interests and contact organizations. Currently, the program has an ongoing relationship with more than 40 different placement sites in the greater Providence area and Boston. Once students have selected a site, they must develop a learning agreement that specifies the objectives, activities, supervision, and daily responsibilities for the internship. This form is required by the College and must be signed in order for you to receive credit in the course. All students must complete 120 hours of work at your field experience site to earn credit for HPM 450. 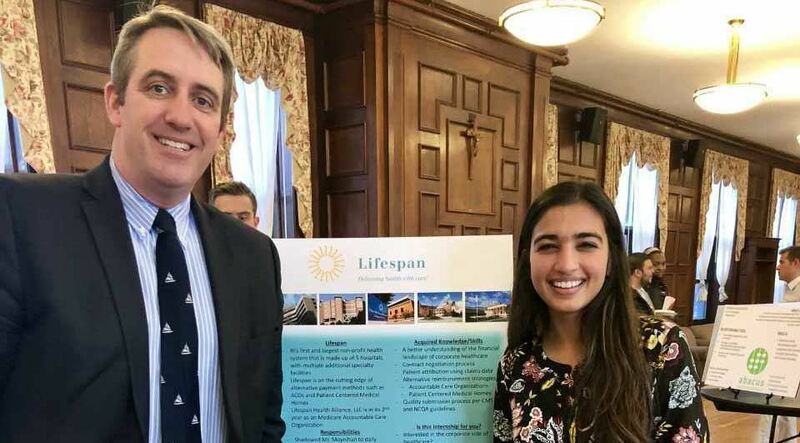 For more information about hosting HPM students as interns, or to learn more about the internship experience, please contact the HPM Field Experience Coordinator, Dr. Todd Olszewski​.